Today we will be learning how to draw Scooby Doo. 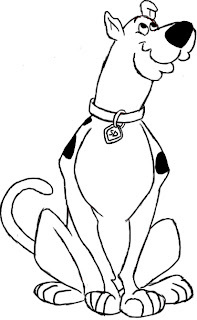 Scooby is one of my all-time favorite cartoon characters ever. So, I couldn’t wait to jump into this tutorial. 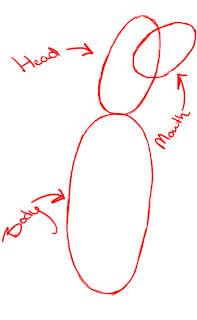 To get our drawing started, we will first need to draw three ovals which will become the body, head and mouth of Scooby. As you can see, the ovals go from smallest on top, to largest on the bottom. Each of these ovals are labeled in the image on the left. 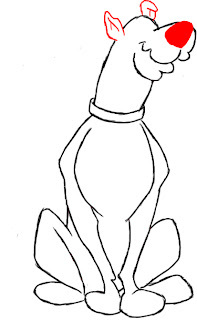 Building off of the largest oval of Scooby’s body, we need to give him some front legs. 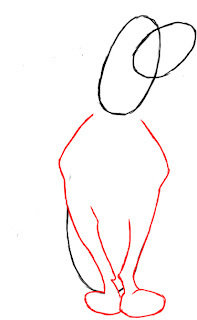 His legs are sort of diamond-shaped, with his feet bending inwards, touching each other. Between Scooby’s arms, draw a couple curved lines that look to form a shape that looks like empty parentheses, ” ( ) “. This will create a chest that divides Scooby’s legs from the rest of his body. 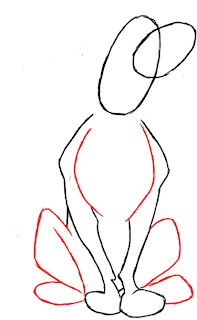 As shown in the image on the left, give Scooby his bent rear legs, which will make him look like he is sitting. 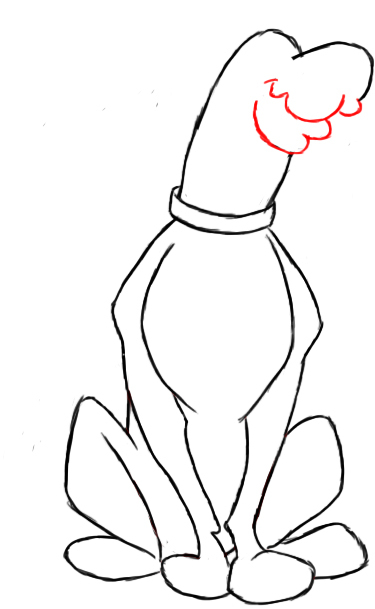 Now we can begin to give Scooby some facial features. 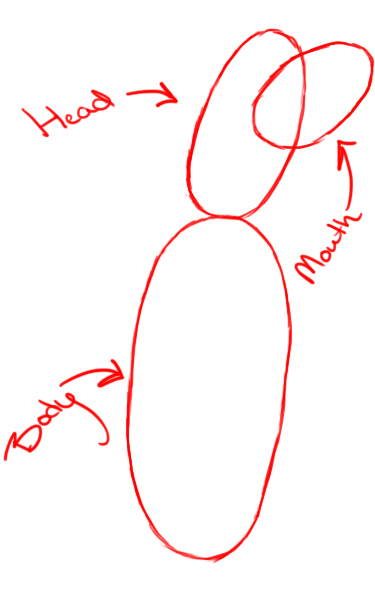 Erase the overlapping lines between Scooby’s mouth and head, and draw in a chin and lips like what’s shown in the image on the left. 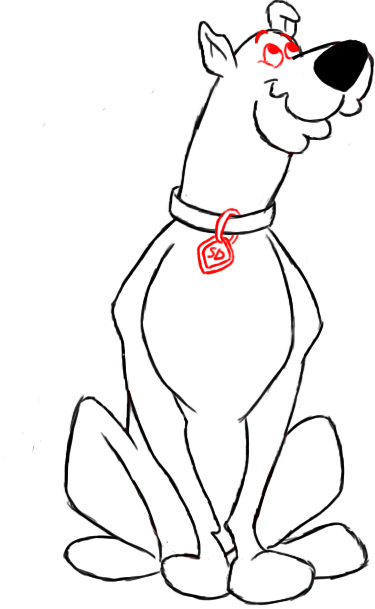 You can also give Scooby a collar at this point. 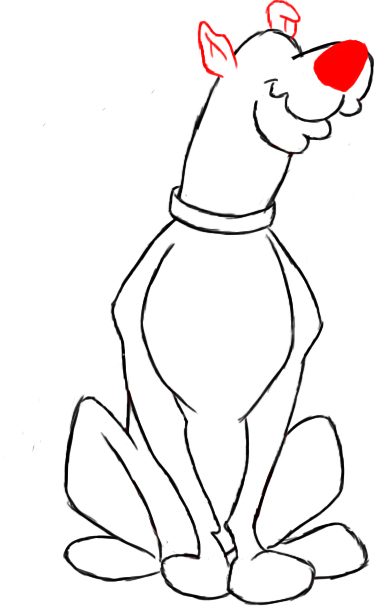 On top of Scooby’s head, draw his floppy ears. Like always, one of his ears is points straight up, and the other one folds down. 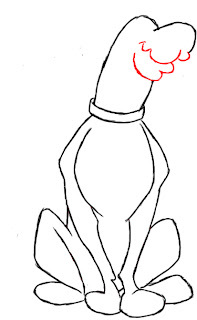 Also, give Scooby Doo a large triangular nose, that dominates most of his face. 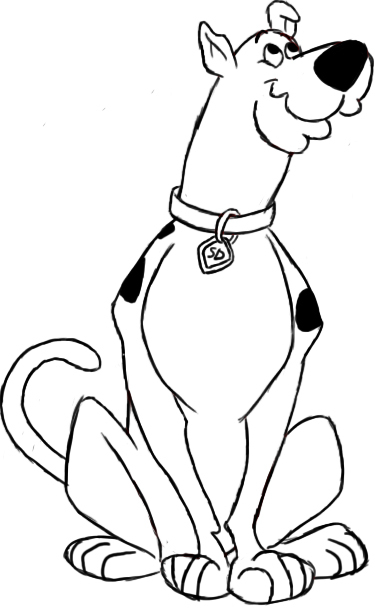 Give Scooby two small eyes that sit right behind his nose. Two upward pointing eyebrows will make it look like he is gently smiling. 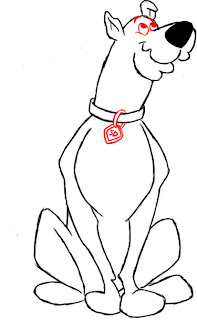 Don’t forget to give Scooby his trademark “SD” dog tag! At this point, Scooby Doo is done. 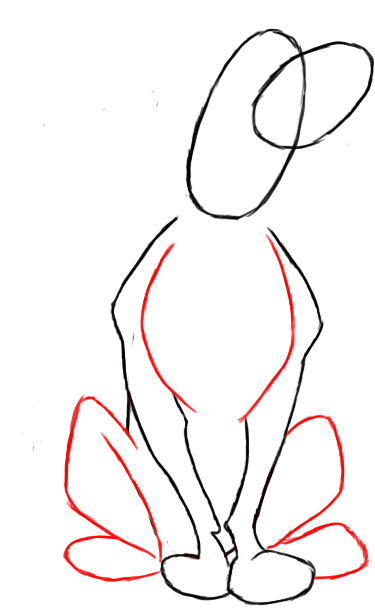 All that’s left to do is give him a few spots on his shoulders, and draw in his long tail. That’s that! I hope you’ve enjoyed this tutorial. Don’t forget to comment and like us on Facebook. Thanks everyone!